Jonathan Franzen is the novelist who is either madly loved or hated right now. Other novelists are upset by the amount of attention his new novel "Freedom" is receiving. He is one of only two novelists to ever be featured on the cover of TIME magazine and there are reviews in print and on-line all over the place. So I'm not going to review the book other than to say that people who loved "The Corrections" will feel similarly and those who didn't like it will also feel the same. The most recent novel is set, mostly, in Minnesota and St. Paul in large part. He will be kicking off the Fall season of Talking Volumes at the Fitzgerald Theater--though the event is already sold out. Alas, not every quality novelist can be featured on the cover of magazines with massive circulation numbers and fancy, glossy, covers. 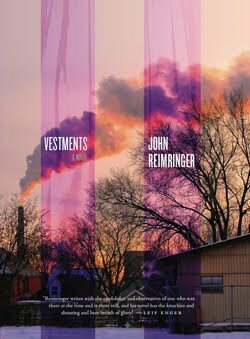 St. Paul's own John Reimringer also has a novel just published that is set, mostly, here in our fine capital city. Next Friday, the 10th, at 7 p.m. Reimringer will be having the launch event for his book in the store. We're very exicted for this event and anticipate a large crowd so be ready to jostle for space if you're coming. A few years ago John read here for an event with Milkweed about their anthology "Fiction on a Stick: Stories by Writers From Minnesota" and the story he read from is entitled 'Betty Garcia.' She is one of the main characters in his novel "Vestments". So we're bringing this whole thing full circle and couldn't be happier to be involved in two great events for books set in this city we so love.